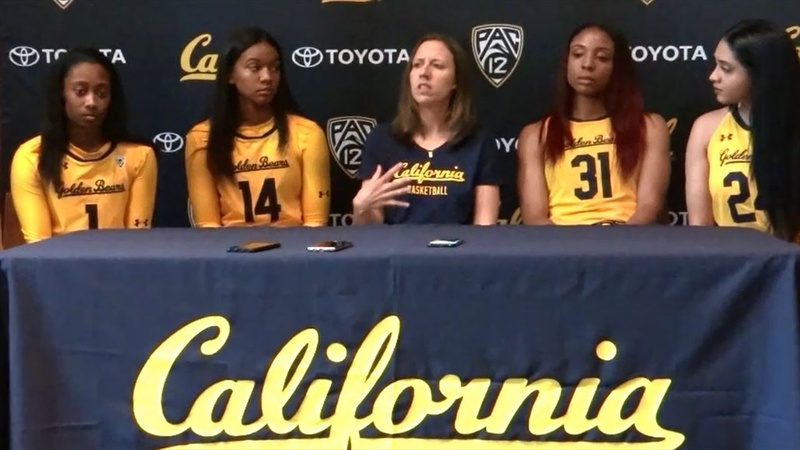 The California Golden Bear women's basketball team wanted to get the message out early: they are excited about the upcoming season, and they expect it to be a memorable one. "We have a chance to be really special," said Cal head coach Lindsay Gottlieb. With the season over 2 months away, the Bears took the unusual step of inviting select media to a press conference to preview the 2018-2019 season. The Bears return three starters from a 21-10 team that made the NCAA Tournament, including leading scorers and seniors Kristine Anigwe (16.7 ppg) and Asha Thomas (12.8 ppg). Kianna Smith (team-leading 4.8 assists per game) looks to build on her strong frosh campaign, which culminated in a 20-point, eight-assist performance in the NCAA first-round loss to Virginia. While the Bears will miss the contributions of stalwarts Penina Davidson and Mikayla Cowling, Cal is confident in the growth of its returing players. "Everybody has improved," said Thomas, going on to explain that she has grown as a leader. "Being more vocal. Disciplining myself as well as my teammates. I'm trying to go out with a bang, and for them to go out with a bang." Gottlieb also sees growth in how her players are coming together as a team. "It is a lot louder in the gym all the time. It breeds confidence. It makes me know how bought in they are, how much they understand what's at stake. I think our reps are better. The way they push each other and support each other is more nuanced." Thomas was also proof of the Bears' off-season work in another way, as the point guard looked to be in the best shape of her career. Another player who had a visible physical transformation was junior post CJ West. "We've been working really really hard," said West. "Something just clicked, and our mindset has changed. Everyone is working so much harder. We're all doing so much more, not only as a team but ourselves--like school, handling our stress, getting extra stuff done on our own, working out on our own. All of that that we've done in the summer has translated, now that we've come together in the fall. Everyone is taking a step up." Fellow post player Chen Yue chimed in: "This past summer, there was a lot of strength and conditioning, so I can feel my body get stronger and faster and more powerful. With Charmin, I really worked on my hook, so with my height, if I can do a hook really well, no one can defense for that." The Bears are also counting on junior Jaelyn Brown, who believes that she now has better clarity of her role and will be able to bring her diverse skills to the court on a more consistent basis. "I was a young player, and I was just learning how to play college ball. I now feel more comfortable. think I just need to fine-tune some of those things: my dribbling, mid-range, three-point shooting. Just clean it up a little bit." Brown shared that she will be playing some power forward this year and hopes to help the Bears battle for rebounds. "We have some returning people that have come a long way," said Gottlieb. "And then we have new pieces. We have as much depth and skill level as we've ever had." The Bears welcomed three new players, including McDonald's All-American McKenzie Forbes. "McKenzie Forbes is the most veteran freshman we've ever had," said Gottlieb. "She's sort of a jack of all trades. She's very savvy." Cal also added walk on Sierra Richey and grad transfer Recee Caldwell, who previously played at UCLA and Texas Tech. "I'm really analytical with the way we recruit," said Gottlieb about the decision to add Caldwell. "We have a purpose to everything, and it's by design that we have our first grad transfer. We wouldn't have taken anybody. We wanted someone we knew and trusted as a human being. She's going to provide a lot in terms of experience and leadership." "I think our team can be really special, which is why I came here," said Caldwell. "I've known the coaching staff since I was in middle school. so my relationship with them has been a lot more personal than past programs that I've been with. That trust in your coach sets you free to play basketball." Cal will also have the services of redshirt sophomore Mi'Cole Cayton, who is returning from a torn ACL that sideline her for nearly all of last season. "I'm doing really well," said Cayton. "On August 31st, it'll be eight months. I got my brace now, so even though I can't do full contact yet, I can do one-on-one." Cayton expects that she will be able to be able to do full-contact drills by October. The Bears could afford to ease Cayton back in, as they will have depth at guard this season. Cayton is not concerned about what might be a crowded backcourt. "The thing about me is that I'm a competitor," said Cayton. "I have heart. I'm never going to give up. And I'm never going to question about, 'This person should be playing, or this person shouldn't.' We have a great coach who's going to put in the best player, because she feels that's who is better, or who's better that night. I have some great teammates who all love basketball the same amount that I love basketball, and I know when they get on the court they will show out and play. So I'm just grateful to be in the position to start to move again, or start to shoot, so when I'm out on the court, I'll be ready." "I don't think there can be anything wrong with adding more talent," agreed Kianna Smith. "We all want to win, so we're all on the same page. So adding talent can only be a good thing." For her part, Gottlieb believes that the increased depth will allow her to avoid playing people "through fatigue or through foul trouble," as she has had to do in the past. "We will be able to put a lot of different kinds of lineups on the floor. We will be able to play lineups that are bigger--Kristine and CJ together, with Jaelyn Brown and McKenzie. We can also go smaller. And I imagine us playing different kinds of defenses where we can utilize different lineups as well." In addition to the always tough Pac-12, the Bears will be tested by their non-conference schedule, highlighted by a home game against perennial powerhouse UCONN (December 22). "I'm looking forward to the competition," said Kristine Anigwe of the matchup with the Huskies. "I'm so excited to play them." 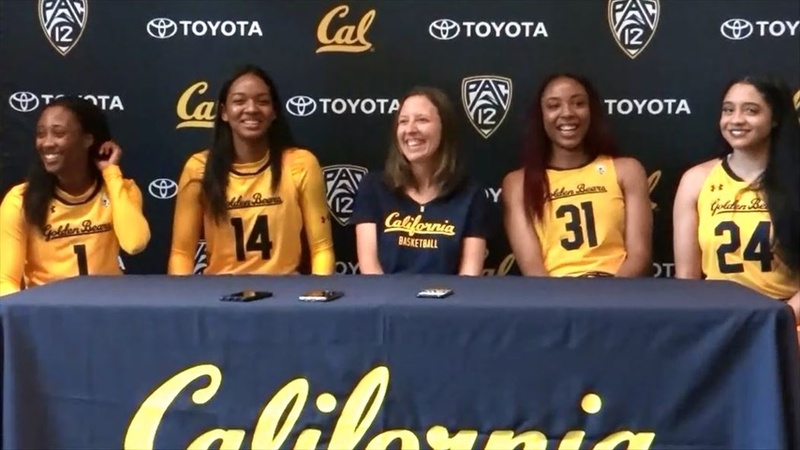 "We want to be the showcase of women's basketball here at Cal," said Gottlieb. "People will come to see Geno and his team, but they will also come and see Cal women's basketball. We can't shy away from the teams that make you play your best." "Just to be fearless," said Thomas about what she hopes to see from her team. "I think that's what this team is about, being fearless." "There's no question our goals this year are different," said Gottlieb. "And the results will follow, because it's a different mindset. We're at a place now where everyone believes in each other's talent. This group, we've had a lot of history, but the focus is on now and what we're capable of doing. We're excited to get the year kicked off, to get basketball season underway." The California Golden Bears tip off their season with an exhibition against Westmont on November 1. Jim McGill contributed to this story.